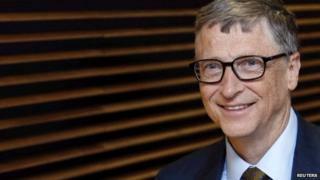 The world needs to prepare for the next major health crisis, Bill Gates has told delegates at the Ted (Technology, Entertainment and Design) conference. While Ebola seems to be being kept under control currently, next time "we may not be so lucky" the Microsoft co-founder warned. He said that there were plenty of technology tools that could be used to contain the spread of a virus. And, he added, governments should learn from how nations prepare for war. "Nato plays war games to check that people are well-trained and prepared. Now we need germ games," he said. He also called for a reserve "medical corps" similar to the reserve armies that civilians can join. Technology can play a big role in helping prevent the spread of a virus, he told the Ted audience. The proliferation of mobile phones mean that citizens can easily report where disease breaks out and satellite mapping can quickly collate where the problem areas are. During the Ebola crisis, technology firms such as IBM contributed tracking systems that allowed the authorities to create detailed maps of outbreaks based on text messages from citizens. Bill Gates has long had an interest in global problems such as poverty and disease and the Gates Foundation, which he set up with his wife, has contributed millions to help solve the issues. During the recent Ebola crisis, the Gates Foundation shipped vests lined with ice-packs to help doctors and nurses, who must cover themselves in protective gear, keep cool. At the Ted conference, a mock-up of an Ebola hospital showed how tough life is for the doctors and nurses who work in them. Delegates were invited to try on a protective suit, perform tasks in it and take it off without allowing any part of it to touch skin. More long term it is vital that strong health systems are built in poorer countries, Mr Gates said. Meanwhile the world needs to be prepared for the next epidemic. "We can get ready, we don't need to panic. We don't need to hoard cans of spaghetti and hide in the basement," he told the Ted audience. "If there is any good to have come out of the Ebola crisis it is that it has acted as a early warning, a wake-up call," he added.